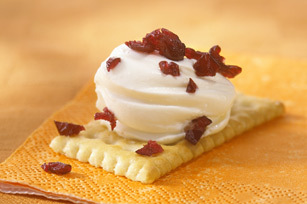 These crispy crackers with a creamy topping and bits of chewy cranberries are sure to become a snacking favorite. Try other types of dried fruit like raisins, cherries or apricots. Add a sprinkle of ATHENOS Crumbled Blue Cheese. Add a sprinkle of PLANTERS Walnut Pieces.